Designed in Europe and built in China, AKG's latest studio mic aims to deliver value for money. Austria's AKG have a long-standing reputation for building and designing high-quality recording microphones, a number of which have become studio classics. However, they also acknowledge the need to compete with the avalanche of far eastern microphones in the project studio sector, and that's tough to do with European manufacturing costs. To get around this, AKG designed their new Perception models in their Vienna facility, then had the mics built in China under their own quality control regime, the idea being to combine the advantages of Austrian design and Chinese manufacturing to maintain an attractive price. Conceptually, the Perception 200 reviewed here is a fairly conventional cardioid-pattern, large-diaphragm (one inch) true capacitor microphone, running from 48V phantom power. The Perception series includes a second model — the Perception 100. Both mics share the same capsule design, basic technical spec and construction style, the main difference being that the Perception 200 is equipped with two additional switches, for a low-cut filter and a -10dB pad. The Perception 200 also comes in a neat metal carry-case, complete with a heavy-duty spider-type shockmount. The shockmount is very nicely designed using a metal frame with sensibly large securing hooks to hold the elastic suspension bands. A threaded ring at the base of the shockmount screws into the base of the microphone to fix it securely to the mount, so you can use the mic upside down without any fear of it working loose. The frequency plots supplied by AKG for both models are nominally flat above 100Hz, with a gentle roll-off below that, and there's also a very gentle presence hump up at around 10kHz, which should add a nice airy quality to the sound. The overall response is quoted as 20Hz to 20kHz. With an open circuit sensitivity of 18mV/Pa, the Perception 200 has an A-weighted noise figure of 16dBA, or a signal-to-noise ratio of 78dBA referenced to 1Pa. This is very typical for a microphone of this type, and although you can buy quieter microphones the specification in this respect is more than adequate for typical close-miked vocals and other common studio applications. The maximum SPL without the pad switched in is 135dB (the same as the cheaper Perception 100) and the low-cut filter rolls off at 12dB per octave below 300Hz, to compensate for the proximity effect or to exclude low-frequency sound when recording instruments that have no significant low end. 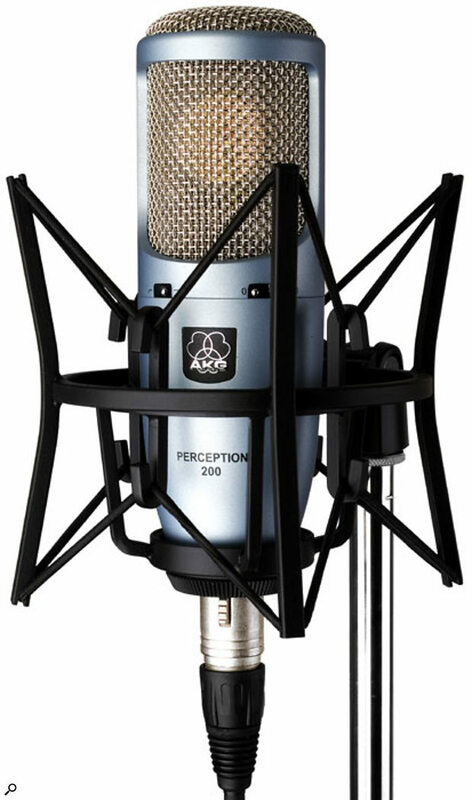 The AKG Perception 100 is cheaper than the 200 but doesn't have a pad or low-cut filter.Photo: Simon CamperPhysically, the Perception models have a distinctive truncated bullet shape, the 200 model being differentiated by a light-blue metallic finish and two recessed toggle switches for the filter and pad. The body is solidly made from cast alloy, weighing about half a kilogram, and there's a robust dual-mesh steel grille protecting the capsule. Unlike most Chinese-made mics, which can be accessed by unscrewing a locking ring at the bass of the body by hand, these models use a recessed locking ring that requires a special tool to undo. Not having such a tool, I couldn't take a look inside to comment on the internal construction of the mic, but I don't anticipate any untoward surprises there. As a vocal mic, the Perception 200 combines a warm low-end response with a subtle top-end airiness, which is what I'd expect from the shape of the frequency plot. For comparison, I tried it alongside the low-cost Audio-Technica AT2020, which I felt hyped up the low end a little less and also sounded more focused, but it wasn't a case of better or worse — just different. Both produced a similarly low level of background noise with the preamp I was using, so, as ever, it comes down to deciding whether the mic in question is a good tonal match for the singer you're working with. Certainly the Perception 200 doesn't have such an overbearing character that it wouldn't make a good general-purpose studio mic, but at the same time it still has a slightly flattering sound that will inevitably suit some voices better than others. If you're working with a voice that needs both gentle low-end support and help with high-end projection, the Perception 200 should do well, but, by the same token, if the singer you're working with already has a strong low end, you might need them to back off from the mic a bit, to prevent the low end from becoming over-emphasised. Of course, you can also use the low-cut filter on the Perception 200, although with some voices this may thin out the sound too much. The call is definitely an artistic one. As an acoustic guitar mic, the Perception 200 works fine, providing you take the time to find the best spot to position it. Any tonal flavour the mic has can be fine-tuned by adjusting the mic position, and the slightly lifted high end helps bring out the string articulation without making the result sound scratchy. Although the mic has a cardioid pattern, it still picks up other sounds from around the room, so you need to use the mic in a controlled environment where possible, but this is true of most sensitive capacitor microphones. Given that the Perception 200 is priced to compete head-on with other Chinese-made microphones, it has to be considered great value for money, especially taking its excellent build quality and bundled shockmount into account. As my tests showed, it has its own tonal character, which is true of the majority of large-diaphragm cardioid studio mics, but this character isn't so pronounced that it restricts the mic to working with only a small number of voice types or instruments. If you buy a mic to record yourself or a regular band member, you should still compare it with other similarly priced models, in case one suits the voice better (see 'Alternatives' box). Whichever way you look at it, the Perception 200 is a very nicely designed and solidly built studio microphone that has the makings of a good all-rounder. If you're in the market for a sub-£200 studio mic that's built to last, you should definitely consider the 200, but if your budget won't stretch that far, you could check out the lower-cost Perception 100, which will give you essentially the same results, unless you need to pad down very loud sound sources. It really does pay to take a little time to track down the mic that works best for you, and there are lots in this price range to choose from. Of those that I've personally tested, I'd suggest looking at the Audio-Technica AT2020, which I think is a real gem for the price. It's cheaper than the Perception 200, but it doesn't have a built-in pad or high-pass filter and it doesn't include a shockmount. Other contenders include the Rode NT1A, which has a very clean and classy sound, and the slightly more expensive SE Electronics 2200A, which also comes with a case and shockmount. MXL and Studio Projects also make some very nice-sounding mics in this price range. Clean sound with a hint of flattery at both the low and high end. None at the price, but make sure the mic's character suits the principal voice being recorded. AKG would appear to have succeeded in building a very attractive and warm-sounding studio microphone at a price most project studio owners can afford. Perception 200 £169.99; Perception 100 £119.99. Prices include VAT. Harman Pro UK +44 (0)1707 668222.